These hats are cute, but even cuter with a rat head under them. This cute little Santa Elf inspired hat is fun and cute on your rattie. It is made of quality polar fleece. 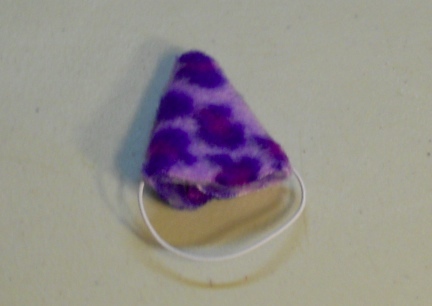 The hat attaches to the ratties head with elastic. 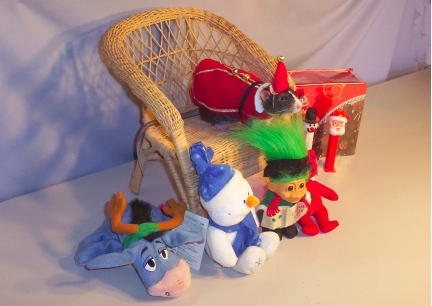 The photo is of our little rattie Little Mac in his Deluxe Santa Suit with Hat that has a bell on top. All the money you spend with us goes to care for our animals here in NW SD, but not one of them has tried on or been around the items you purchase. Our rattie items are not refundable and are non refundable. If there should be a problem with craftsmanship, we are happy to repair or replace the item. We will use fabrics as close to the original as we have. Thanks. ITEMS WERE HAND CRAFTED IN OUR NW SD USA NON SMOKING HOME. All money you spend with us goes to care for our animals here in NW SD, we appreciate your business. This smaller item has a smaller shipping charge of $1.68 to the USA when shipped with similar items. Your shopping cart will show your shipping costs and total based on the items in it. Many people let their ratties run free in their homes. Start slow, start on just a table top or your bed. Be warned. While you can potty train a rat, for the most part, they just go... They also are rats and will chew cords, hide, and can get lost in your home.